In 2019, working with Habitat for Humanity Ontario Gateway North (HFHOGN), the Pointe au Baril Adopt-A-Home team plans to build a decent, affordable three-bedroom home for a local family. The Pointe au Baril Adopt-A-Home Project team, comprised of community members, seasonal residents, business owners and support from the Township of the Archipelago, continues to advocate for affordable homeownership in Pointe au Baril. The property at 132 North Shore Rd., graciously donated by the Morel family, will provide a wonderful homeownership opportunity for a local family. As a Habitat for Humanity build, HFHOGN will assist with build planning and project management, oversee the family selection process, provide support to the future Habitat homeowners throughout the build process and administer a no down payment, no interest, geared to income mortgage. Monthly payments made by the family, set at 25% of annual household income, are applied first to property tax and then to the mortgage principal. All Habitat homeowners go through a rigorous application process so Habitat can determine their level of housing need, their ability to repay Habitat’s interest-free mortgage, and their willingness to partner with us. Potential homebuyers might be dealing with poorly maintained, unhealthy or overcrowded housing; unaffordable rent; inaccessible housing for people living with disabilities; a long commute into Pointe au Baril for minimum wage work; or have other shelter needs. Families selected as Habitat homeowners must volunteer up to 500 hours and pay an interest-free, affordable mortgage – geared to their income – to buy their home. The annual family minimum income in order to qualify for this home is approximately $35,000, but depends on the size of the family. The affordable mortgage payments go into a revolving fund that allows Habitat for Humanity to build more homes and provide more people with affordable homeownership opportunities. Habitat homebuyers put in hundreds of hours volunteering with Habitat. This typically involves helping build their own home or the homes of others in the program, volunteering in their local Habitat ReStore as well as taking classes in personal finance, home maintenance and other homeownership topics. If you think you, or someone you know, may qualify, contact Susan McCool, Family Relations Manager for Habitat for Humanity Ontario Gateway North at (705) 646-0106 x209 or smccool@habitatgatewaynorth.com. The planned home is a 1,000 sq. ft. high performance, low energy, two story, three-bedroom home. A high-performance home can have annual light, heat and power expenses that are one-third the cost of standard homes built to code. The heat loss calculations for the planned build, based on installing two low temperature air source heat pumps, project heating costs under $500 annually. The backup heat source is a propane direct vent stove with portable generator support for critical electrical items. The incremental cost of a high performance building, in comparison to a standard build, can be low, especially with the use of volunteer labour. However, over 20 years a family can save $40,000 or more in heating costs. The home is expected to be awarded the BUILT GREEN CANADA certification for energy efficiency and be Net Zero Ready. The building plans will be made available to others upon request. The plans also support community green energy conservation programs offered by organizations like the Georgian Bay Biosphere Reserve, Canadore College and the Ontario electricity program. If you would like to look at the full set of plans, contact Bob Fisher as per the contact details provided at the end of this article. The volunteers to take part in construction of the home will be recruited from the seasonal, village, First Nations, educational and business communities. From February to early April there are volunteer opportunities for lot clearing and pre-building window and door frames and the fixed window awnings. From mid-June to the end of August the planned schedule is for 90 volunteer days. 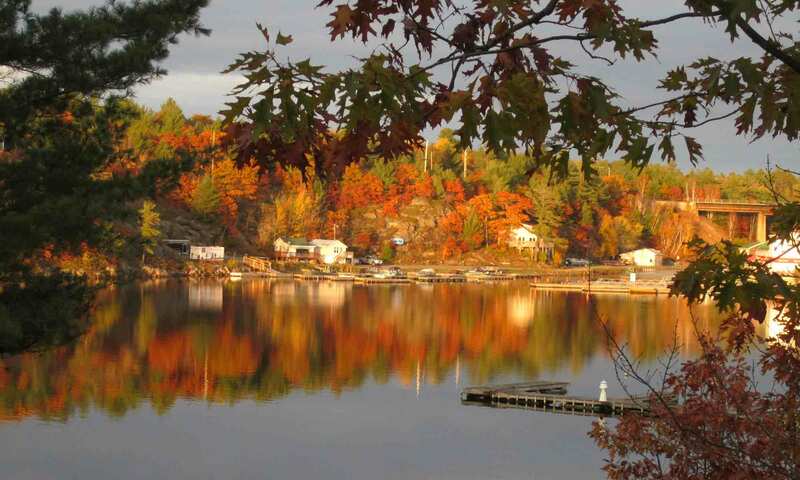 After the cottage season and the wind down of the on-water construction season more of the volunteer help will be from the year round community. Licensed trades will be hired as required for work such as foundation, roofing, electrical, HVAC (heating & ventilation) and plumbing. The success of the project relies on raising $200,000 cash, in addition to the donation of in-kind goods and services. The building lot, development costs and environmental assessment costs have already been donated by, respectively, the Morel family, the Township of the Archipelago and the Georgian Bay Biosphere Reserve. To date, over $100,000 has been raised, giving the project clearance to move ahead in the spring. The building permit has been secured! Contracts have been established for the driveway, site scraping and septic to Bruce Bishop of All Seasons and for the well and pressure water system to Conrad Well Drilling. A contract for tree felling needs to be secured so volunteers can burn and/or remove the brush before fire season. The build approval under MNRF Fire Smart regulations requires a minimum 10 metre no vegetation zone around the home and from 10 to 30 metre reduced vegetation is preferred. To further reduce fire risk, siding and roofing with fire-resistant metal will be installed with donation support from Stanley Steel of Parry Sound. During March and April, a heated shop is needed to pre-build elements of the house and skilled hands to build them. Quotes on materials and services from area businesses are underway. Contact Bob Fisher as per the contact details provided at the end of this article to discuss your interest in quoting on or volunteering on components of the build. We need your support! Whether you want to donate time, materials or cash, your support makes a difference. Donations of cash will help in securing critical materials and services for the project. The weekly build schedule will be Wednesday through Monday each week of summer. To volunteer, please fill out a volunteer information form so we can stay in touch about scheduling. Contact Rob Muir as per the contact details provided at the end of this article to obtain a Volunteer Application Form. You can even book a group volunteer day for your family reunion, social group, neighbors, school mates, or business. Children over 16 can even help on site, with parental permission. A group volunteer day enjoys a fun-filled day on the build site, required training for the day’s activities, a picnic lunch and snacks and more. Meet new friends and learn new skills, all while helping a local family achieve strength, stability and independence. Contact Rob Muir as per the contact details provided at the end of this article to make arrangements for a team build day. Tools and equipment that are in good working order can be donated or loaned to the project. A miter chop saw, table saw, drills and hand tools are needed for the build team. Scaffold frames and platforms that are not needed for summer 2019 jobs will save on rental costs. If you have unused construction tools or materials in the back of the shop, consider donating or loaning them for this community project. Contact Bob Fisher as per the contact details provided at the end of this article to make arrangements to donate tools or materials. Village residents and islanders will be donating time, efforts and finances for a common cause of helping to grow their relationships while helping a new family in the Village. This project will encourage new relationships in many ways. Volunteering time and talents affords an opportunity to make new friends, learn a new skill, while helping the village with new energy efficient and affordable housing. Contact Rob Muir as per the contact details provided at the end of this article to obtain a Volunteer Application Form. Many families currently commute to work in Pointe au Baril, just like large urban areas. The limited number of affordable, non-waterfront homes that come available are generally sub-standard and expensive to heat. Conventional mortgage lenders, such as banking institutions, will not support the purchase of these homes. The community does not presently have natural gas service. Electricity, propane, oil and wood are higher cost fuel sources for home heating. Hydro can go out for a day or more during storms, which can adversely affect poorly heated homes. There are village opportunities for additional off-water lot home development for families and an independent living seniors lodge. The opportunity to address sub-standard home maintenance in the village may be an option through future Habitat for Humanity renovation projects. Contact Rob Muir as per the contact details provided at the end of this article to seek more information on future rejuvenation projects.